Andrew Simpson: Who remembers the McLaren Baptist Church in colour? Who remembers the McLaren Baptist Church in colour? Now it is just one of those things that for most of us the past is seen as monochrome images. And it is doesn’t matter if it is a stylish photograph of one of the great photographers or just a holiday snap, most before the 1920s will be in black and white. But the first widely available colour film dates from the 1930s, leaving us with just the hand coloured images which were really just paitned black and white photographs. And that brings me to the appeal for a coloured image of McLaren Baptist Church, on Wilbraham Road, which is no longer is with us. 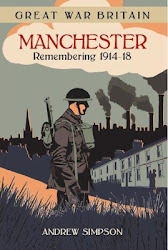 It, along with all the churches, mission halls, temples and other places of worship in Chorlton will feature in a new book by Peter Topping and I. So here is the appeal. If you have a colour picture of the McLaren Baptist Church, or for that matter any of the churches, mission halls, temples and other places of worship in Chorlton please let us know. The earlier the picture the better, but any colour photograph will be welcomed. You can leave a message on the blog under comment, or contact either of us on facebook. There was a baby clinic at the Maclaren. We used to take our new-born for regular midwife checkups in 1971. Now she's a 47 yr old paramedic at Sharston. Doesn't time fly !